The first real-time editor for Football Manager 2019. A powerful alternative to the official In-Game Editor. Comes with basic scouting features too. Last Updated: March 21st, 2019. 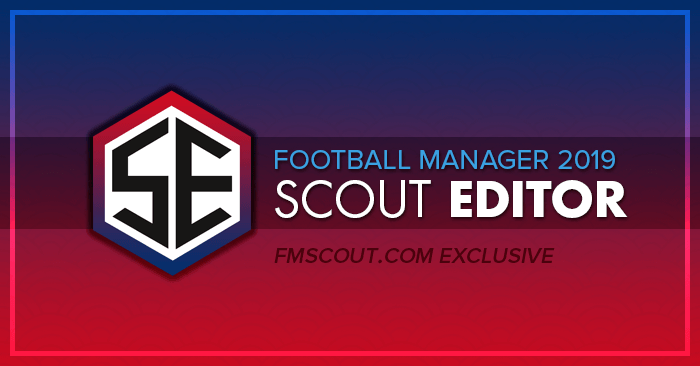 FM Scout Editor 2019 (FMSE19 for short) is a utility with powerful real time editing capabilities and some basic scouting features for Football Manager 2019 and FM Touch 2019. It currently works with Windows 7+ and the latest 19.3.4 Steam version of FM 2019 64-bit. People who want to put FM Scout Editor on other sites, you may link back here but you cannot host any files yourselves. Thank you! FMSE19 is packed with a plethora of options and running lightning fast. The focus is on the editing side of things. The scouting capabilities are limited. For more advanced scouting, it's recommended to try Genie Scout 19. We'll aim to roll out frequent updates to introduce new functionality. Whenever there's a new official patch out, we'll make an effort to update FMSE within a couple of hours. And while update time is dependent on external factors (such as patch complexity or other unpredictable situations), we'll do our best to deliver updates faster than other editing tools out there. Become unsackable! No matter what happens, the board will never fire you. Have no fear of getting sacked ever again! Edit Nation general data, teams, Kits and Agreements. For example, you can disable Brexit by adding England back to EU. 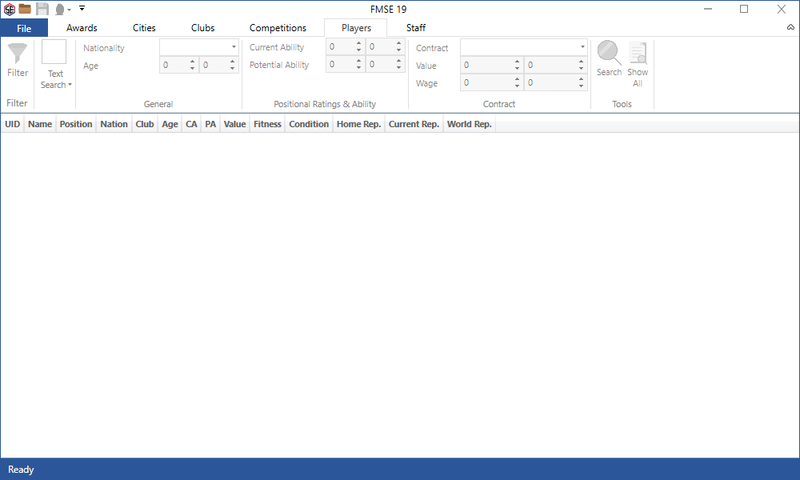 See hidden player attributes, CA/PA & actual left/right foot values right in the game (attributes screen). This is an exclusive feature no other tool for Windows is offering! Edit all kinds of club finances, such as budgets, ticket prices, sugar daddy, sponsors, debts and more. Fiddle with year founded, facilities, youth recruitment, morale, attendances. A vast amount of player details can be edited, including value, all attributes, abilities, contract data, reputation, positions, preferred moves and so on. You can also heal injuries, destroy a player (fitness to 1%) and remove bans. You can now freeze attributes so they remain unaffected by CA, PA or training. Extensive editing for competition, with more editable data than other real-time editor. Scout for and Edit Non-Playing staff like Coaches, Assistant Managers, etc. Quick-actions to Heal Team, Remove Unhappy, Remove Bans and Destroy Team. Change kit style and colours every new season and see these changes apply to the 3D match as well! In-depth editing of awards is possible for all sorts of award details. The most advanced FM Award Editor is here! Edit city details such as coordinates, attraction, altitude and amount of inhabitants. Advanced Mass Edit dedicated panel you can access after selecting 2 or more entities in search results. Multi-select entities using Shift-click, Ctrl-click or click-drag. You can always request a feature that you want that will make this tool better! Just leave a message in the official FMSE forum! Any doable feature requested will make it in one of our next releases. Current version 2.1.20.0 is compatible with Steam 64-bit Windows edition only. Unzip and install by running the .exe file. Open Football Manager 2019 and load your saved game. Click on the load icon (small folder, top left). Double-click on an item from the results. A new window will pop-up and you can edit data there. Once done editing click on the save icon (small disk, top left) for the changes to take effect. You can support the development of this tool by purchasing a license which unlocks the ability to save your edits for the 2019 version. This is an one time upgrade which costs £5.99 / €5.99 / $5.99 (VAT is included!). Software licenses issued for FMSE19 are NON-refundable. Please make sure the app and the features provided are what you are looking for, before purchasing. If you have any questions about purchasing a license, you can contact [email protected] prior to your purchase. If you encounter any bugs, please report them in the official FMSE forum, or by sending an email to [email protected]. Please keep a backup of your save game before using FMSE 19 to edit your game’s data. AppCake Ltd and FMScout.com cannot be held liable for any corrupt game files, or any other issue caused by the use of FMSE 19. A backup will make sure that whatever happens, you will still have your saved game. For support queries regarding licenses, please contact [email protected]. For any other support queries, please contact [email protected]. October 18th - v2.0.2.0 First version, made available 3 hours after the FM19 Beta launch. October 20th - v2.0.3.1 Double update that night (patchfix and hotfix); made available 2 hours after the 19.0.2 patch was released. October 25th - v2.1.0.1 Double update again; made available 5 hours after the 19.0.3 patch was released. Nation editing introduced! October 30th - v2.1.1.0 Patchfix update; made available 4,5 hours after the 19.1.0 patch was released. November 1st - v2.1.2.0 Patchfix and hotfix update; made available 4 hours after the 19.1.1 patch was released. November 7th - v2.1.4.0 Double update (patchfix and hotfix); made available 14 hours after the 19.1.2 patch was released. Register at any time and couple more options introduced. November 8th - v2.1.4.1 Hotfix update to address a crashing issue of FMSE that slipped in after yesterday's update. November 13th - v2.1.5.0 Patchfix update; made available 3 hours after the 19.1.3 patch was released. November 14th - v2.1.6.0 Patchfix update; made available 13 hours after the 19.1.4 patch was released. November 15th - v2.1.7.0 Patchfix update for FM Touch; the 19.1.4 patch for FMT was late by a day. November 20th - v2.1.8.0 Patchfix update; made available 2 hours after the 19.1.5 patch was released. November 23th - v2.1.9.0 Patchfix update for FM Touch; the 19.1.5 patch for FMT was late by a day. December 11th - v2.1.10.0 Patchfix update; made available 7 hours after the 19.2.0 patch was released. December 19th - v2.1.11.0 Patchfix update; made available 6 hours after the 19.2.1 patch was released. December 23th - v2.1.12.0 Patchfix update for FM Touch; the 19.2.1 patch for FMT was late by a day. January 22nd - v2.1.13.0 Patchfix update; made available 1 hour after the 19.2.2 patch was released. January 24th - v2.1.14.0 Patchfix update for FM Touch; the 19.2.2 patch for FMT was late by a day. January 31st - v2.1.15.0 Patchfix update; made available 10 hours after the 19.2.3 patch was released. March 1st - v2.1.16.0 Patchfix update; made available 5 hours after the 19.3.0 patch was released. March 6th - v2.1.17.0 Patchfix update; made available 5 hours after the 19.3.2 patch was released. Had to skip yesterday's 19.3.1 patchfix due to unexpected technical issue. March 12th - v2.1.18.0 Patchfix update; made available 21 hours after the 19.3.3 patch was released. Delay due to public holiday for Thanos and Stam. March 18th - v2.1.19.0 Patchfix update; made available 5 hours after the 19.3.4 patch was released. March 21st - v2.1.20.0 Patchfix update for FM Touch; the 19.3.4 patch for FMT was late by a day. 261 comments have been posted so far. I Purchase licence about 6 month ago and I want download licence again but that link don't work, what should I do? Did you have new link? You PAY for an editor and it can't even find Dimitri Payet. What a rip off. Bunch of scammers. hola, he descargado el Editor y no me carga la base de datos para editarla que puedo hacer? Hello, I recently had to acquire a new laptop and with that in mind I don't have the licence to use it on this machine - is there a way of getting back. Cheers. Hi, does this in-game editor includes changing hair colour in game (3D) ? @Stam Any good news about swaping coaches ? @dutch2005: That part controls the IGA feature (in-game assistant) of FMSE. Game Documents folder shouldn't point there, but to your Documents folder. Please check the relevant FAQ section. Make sure to have FM19 open with your save loaded on it before trying to load it on FMSE19. @SKEPS33: It's not normal. Open Windows start menu, find FMSE19, right-click on it and select "Run as administrator". See if that does the trick for you. hi its been stuck at loading game data for a while now is this normal? I'm guessing the 19.3.4 patch for FM Touch has been released with a 1-day delay, which means FMSE needs to be updated yet again. Having the same problem as @alakhai. Launched FM Touch today and tried to load the game on the last version of FMSE but it says the version is not supported. Quick fix coming? @Stam yes swaping would be good! Updated both FMSE and FM Touch to latest but still getting "Failed to load FM data: Could not find a campatible FM version". Is there a problem or am I doing something wrong? FMSE was updated for 19.3.4 last night. @gZoldik: I'll ask thanoulas if that's possible to implement. With players there's an option to swap; perhaps a similar option could work. @KAIQUE: I've explained how to do this via private chat and it worked. That reminds me we should work on a series of tutorials about how certain things can be done. @trapper_2386: We have prepared the functionality to support multiple languages. Now it's a matter of finding people who can translate the app. Hey, I bought the app and I like it. Though, I'd like to contract a coach to a club, but it seems I can't do it. Can I? How do I remove the licensing restriction of a Brazilian player in the premier league? When will the update come fellas? well, this one costs higher then the in-game editor. Handcrafted in Symi, Hellas. Page created in 0.634 seconds.